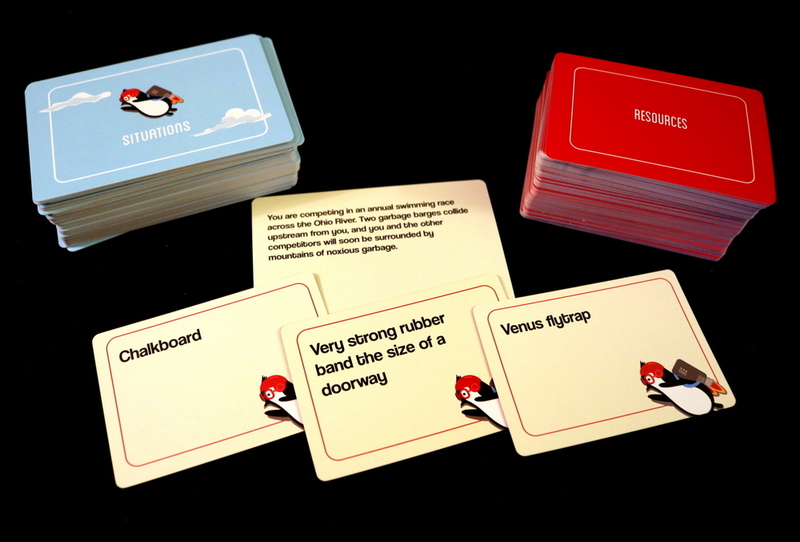 Wing It is a hilarious storytelling and problem-solving game. You and your friends pit your imaginations against each other as you dream up ways to overcome unlikely challenges (...now an eerily well-coordinated horde of angry jelly fish begins to rock the boat until it tips precariously from side to side...) with an even unlikelier set of resources (...and all you have is an ice axe, ten coconuts, a set of snow tires, one pound of leg hair, and a complete collection of Hitchcock films). In each round, the players are all presented with the same challenging situation, but each player has different objects that they can use as their resources to resolve the situation. Each player comes up with a story about how they'll solve the situation using exactly three of the five objects in their hand, and then everyone takes a turn pitching their story to a judge. 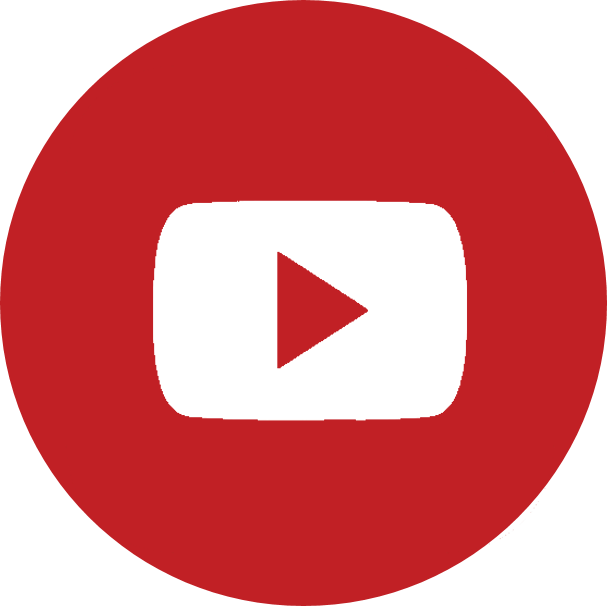 A winning story is selected, a new player becomes the judge, and the next round begins. 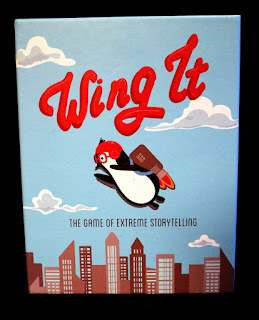 Wing It has been the hit of all my gaming groups--kids and adults--over the past month! 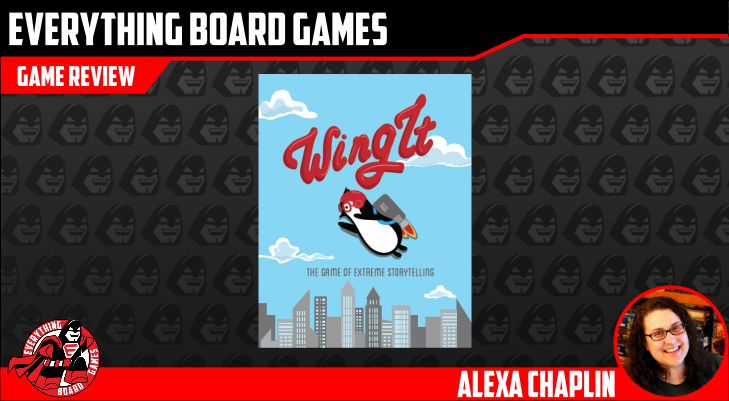 Wing It is an engaging, easy-to-learn storytelling party game where one player is the judge while the rest of the players come up with their most plausible solution from the cards in their hands and describe exactly how their solution would work. The judge chooses the best solution to win the card, and a new judge begins a new round. 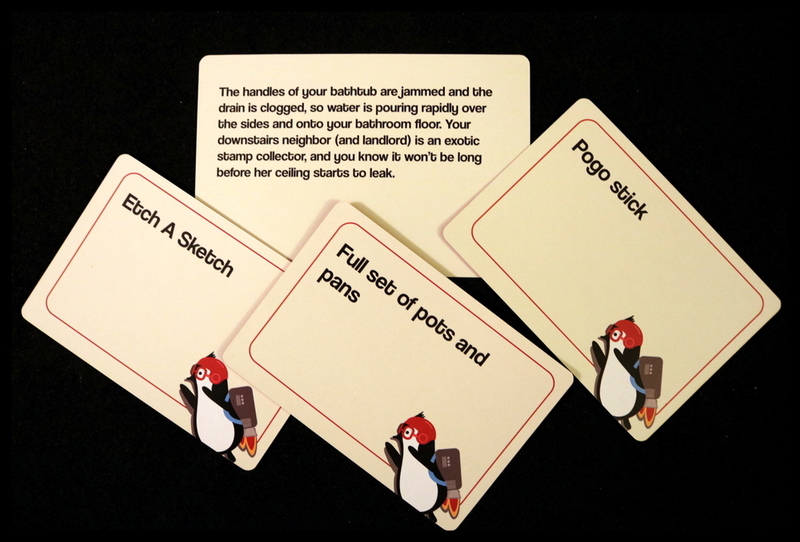 The overall format of the game is familiar but the Situation cards and the variety of Resources make this family-friendly game always a hysterically funny pastime. Wing It is simple to set up and teach. Shuffle the decks of cards and deal everyone 5 Resource cards. 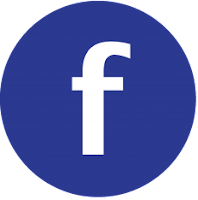 Choose the first Judge, who will draw and read one Situation, and you're ready to play! 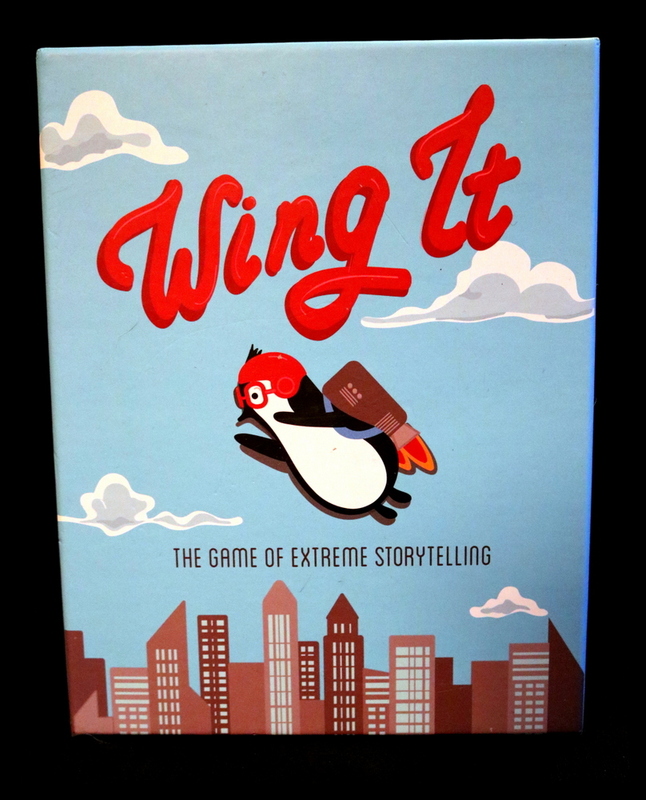 Wing It is, at heart, a storytelling game, so the meat of this game comes from your stories and your willingness to weave a credible solution from random objects! 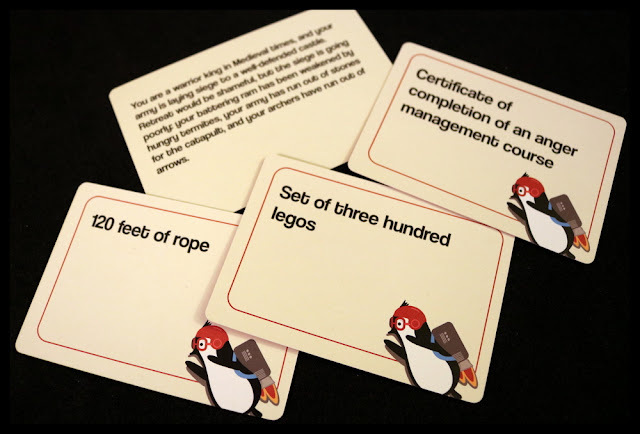 Each player will choose 3 of the 5 Resources in their hand and explain a way that they could solve the problem or get out of the awkward or dangerous situation using just those items. 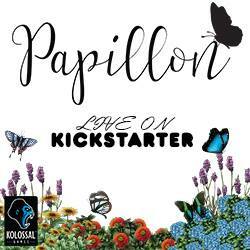 It's a test of your creativity and gets everyone thinking way, way outside the box. Judging is, of course, subjective. The judge can choose the solution most likely to work, the most creative solution, the funniest story, or the best presentation. The judge declares a winner, and that player earns the Situation card. A new Judge starts a new round, and play continues. Play until one player has earned 3 Situation cards, until everyone has had 2 chances to be the Judge, or, if you're like us, until you absolutely have to stop playing in order to go to class, make dinner, or go to bed. Wing It is easy to teach, and easy to learn. It's fun with 3 players, it's fun with as many as 8 players. We played with adults, with kids, with mixed groups, and it's always fun. 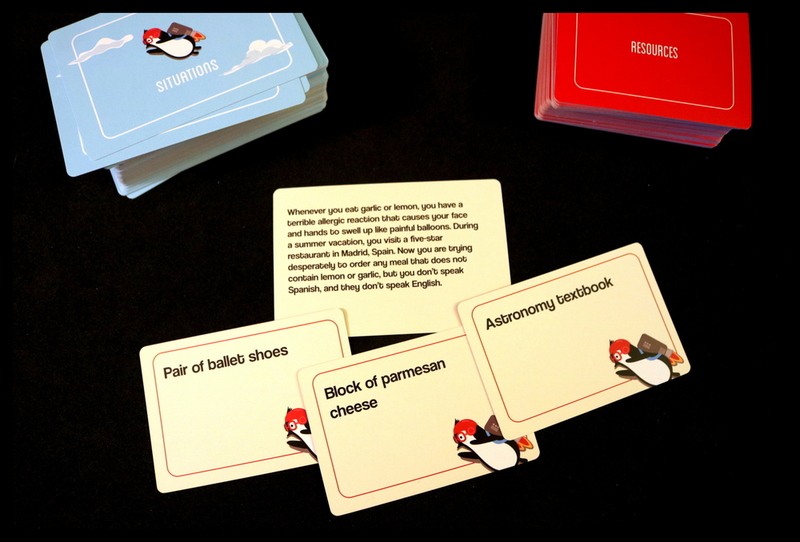 Wing It has been a hit with my Gameschooling ELA class--a group of upper elementary and middle school students who have been using this game to work on their vocabulary, plot, storytelling, and delivery skills amidst raucous laughter and cries for, "Just one more round!" There wasn't a downside for us with Wing It! As with all beloved games, we can wish that one day there will be a Wing It 2 or a Wing It Expansion Pack just to bring even more variety, but it is very replayable just the way it is. 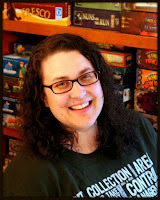 Players who enjoy storytelling or idea-judging games like Snake Oil, Dixit, Apples to Apples, etc. will enjoy Wing It. 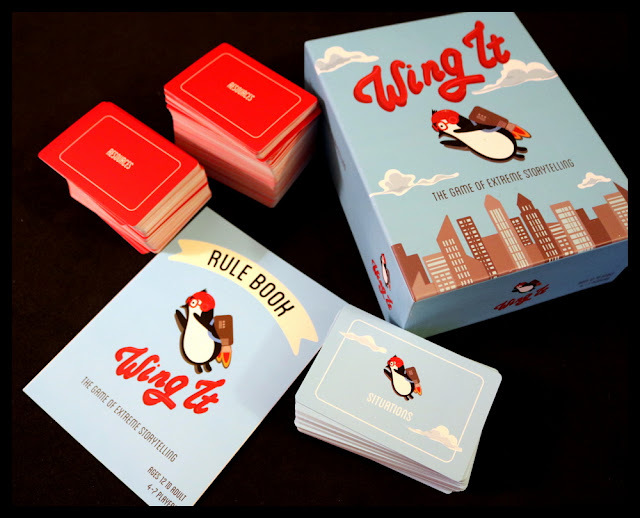 Wing It is a delightfully goofy, engaging game for families and groups of friends. 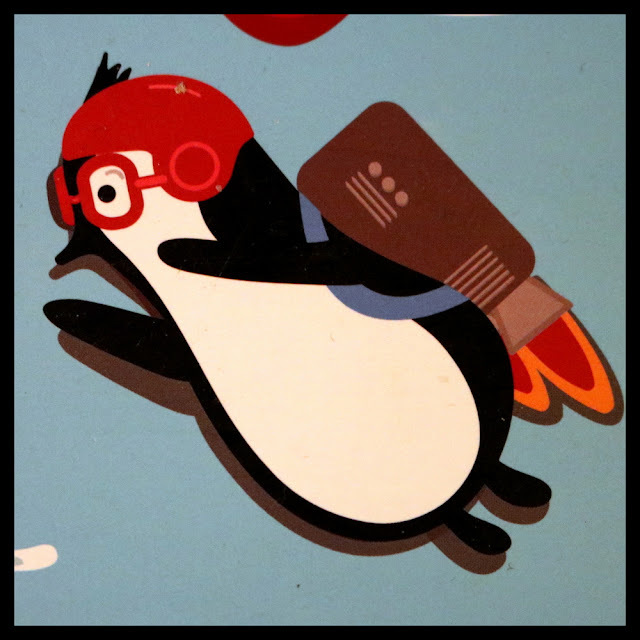 The situations and resources are diverse and the penguin mascot is adorable. 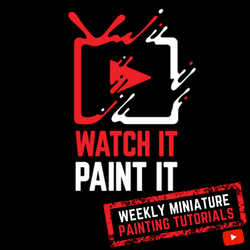 Since starting to play this game with my family, friends, and homeschool groups, I know several families who have gone on to buy their own copy to have fun with their own families--it's that kind of catchy, enjoyable, light-hearted game.